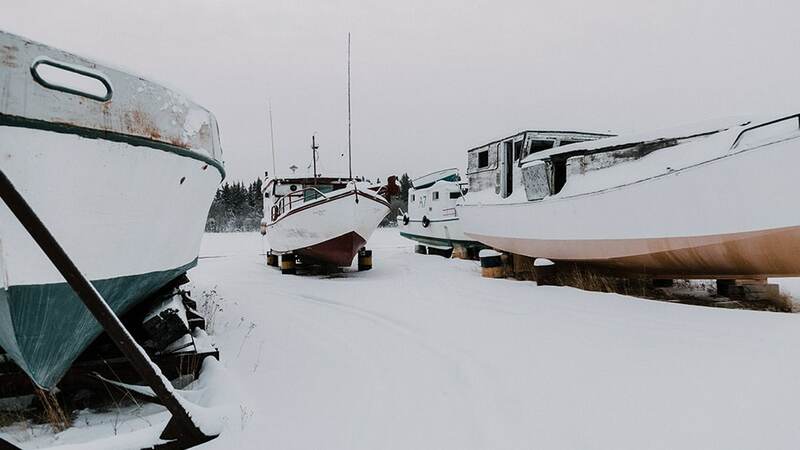 Now really is the time to winter-proof your boat. If you find it all a little daunting and are not sure where to start, then you’re in luck! This post will help assist you in making sure you give your boat all the TLC needed before giving your boat a rest. When checking your hull you want to look for stress cracks (these are commonly found around the bow eye) and gel coat blisters. Stress cracks are something you should take a really good look at as they can indicate much more serious structural damage. If there is anything underlying, you should get it looked at by a professional. Gel coat blisters are a little easier to deal with. You need to puncture the blister, drain it, leave it to dry and then patch the hole with a marine specific epoxy-based filler. However, if your hull is made from aluminium and therefore has no blisters, you can gently bang the drum slowly with a rubber mallet to even out any dents. If any barnacles or other such creatures have attached themselves to the bottom of the boat, they need to be removed. There are various ways of removing them by using power tools, scraping them off or even using a high powered pressure washer. Once they have been removed, you will need to sand down the surface to remove the residue. 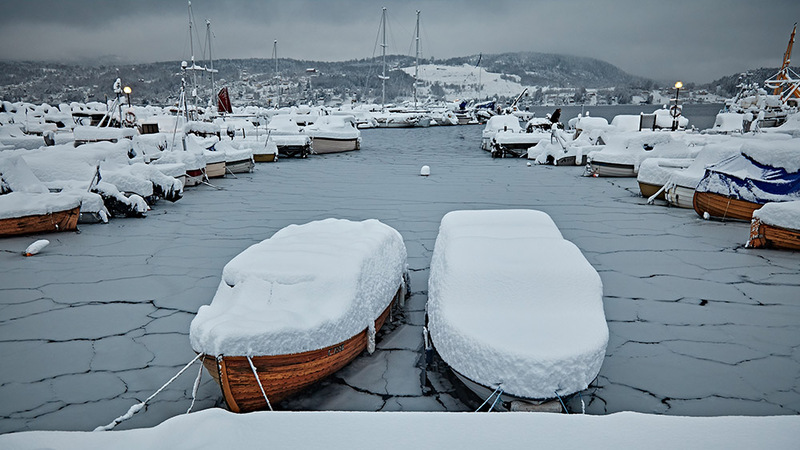 There are 3 main concerns with your boat’s engine come the Winter; corrosion, freezing and fuel degradation. To start, check your engine for any loose or frayed wires, loose connections etc. and replace as needed. Check the condition of any hoses and replace ones that have any cracks or signs of damage. Then check on the condition of the belts and if needed, adjust the tension. We also recommend touching up any nicks to prevent corrosion. After these tasks have been carried out, run the engine up to temperature and then change your oil and oil filter. Boat gasoline breaks down when in storage. Light gasoline factions evaporate and the heavy ones form a clogging sticky varnish. This type of degradation can happen in as little as two weeks! Adding a fuel stabiliser to the tank and then idling the engine for 10 – 20 mins will distribute it throughout the whole system. 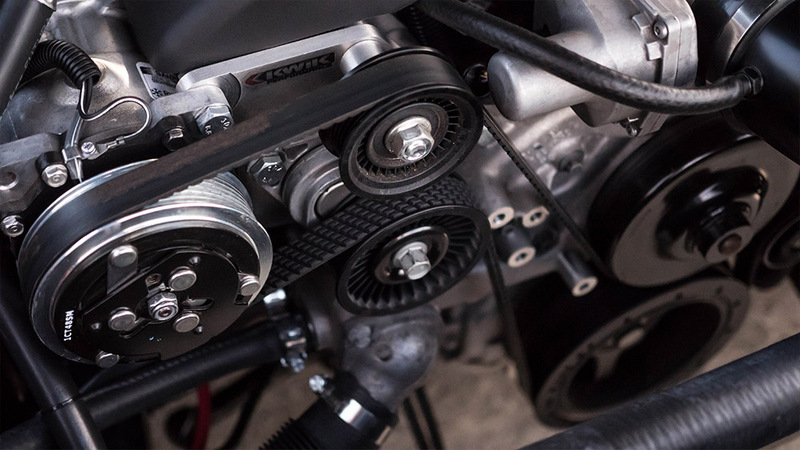 To protect the internal parts of your engine from rust and corrosion, you can spray fogging oil or two-cycle oil down into the carburettor while the engine is running. Then, shut off the fuel supply to burn up any of the remaining fuel in the system. You can spray the spark plugs with fogging oil / two-cycle oil too. Owatrol Transyl is a lubricating, deep penetrating, self-spreading liquid with exceptional ‘wetting’, spreading and climbing properties. It is able to reach the most hard to reach areas and is perfect for the dismantling and maintenance of metal assemblies and for lubricating hard to reach metal parts. Releases – Frees and loosens fixings seized due to rust or corrosion and deposits lubricating film between seized parts, allowing them to be dismantled. Penetrates – Excellent ‘wetting’ properties allow Transyl Oil to spread quickly and penetrate deeply. Lubricates – Allows easy movement of stiff and seized parts (ideal for machining). Cleans – Dissolves and removes dirt, grease and grime. Protects – Leaves a thin protective film on metal surfaces to shield against damage caused by moisture and oxidation. Moisture – Displaces moisture and quickly dries out electrical circuits – prevents moisture induced short circuits. Self-spreading – Very low surface tension and natural capillary action – climbs vertical metal surfaces and penetrates hard to reach areas. Remember, if you take time to care and look after your boat now, come the Spring it will be quick and easy cruising! This is something you do not want to skip over. Vinyl interiors can suffer a great deal with the Winter weather if not properly prepared. Excessive moisture in the air can spell for a mould and mildew disaster. What you will need to do to prevent this from happening is to make sure your boat cover is vented for good airflow – this will minimise trapped moisture. There are products on the market such as chemical dehumidifiers and mildew sprays which are very helpful as they pull excess moisture from the air. There are also other things to consider with your interior care. Moisture can cause issues in other areas too such as corroding your onboard electronics. Any non-marinised wiring is particularly prone to corrosion which can in turn cause short and blow fuses. This can be an expensive fix! Then spray all electrical connections with a moisture displacing lubricant. We recommend then just giving all the interior a really good deep clean so that it is ready to go come the Spring. 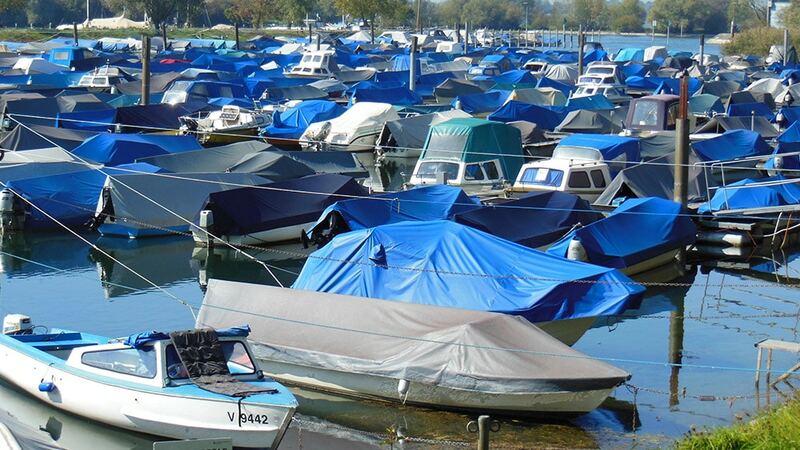 Make sure you choose a boat cover that protects the waterline. Poly-vinyl covers are very popular and offer the maximum water repellency along with resistance to stains and mildew. Just be sure the cover is securely fastened so that the wind cannot get underneath – your boat will not be safe from the Winter and you may even shred the cover. Another popular type is a Poly-tarp. These are inexpensive but do require to be used in connection with a frame. This will distribute the weight of any snow evenly and move it away from any weak areas of the boat. You can find frames very easily, or you can even make your own out of PVC piping or aluminium tubing. There are two things you can do here; fill your fuel tank and add a fuel stabiliser, or, fill up with only fuel stabiliser. Filling your tank means there will be less room for condensation to form meaning your fuel should be protected. However, some manufacturers state that ethanol could potentially spoil during Winter no matter what you do. The less fuel you have means there will be less potential spoiling, therefore less to drain and dispose of. Regardless of the route you take, you should also change the fuel filters and water separators. 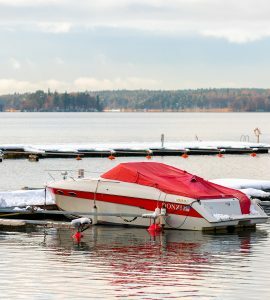 If you have opted for in water storage, there are a few things that you need to do to Winterize your boat. And that just about covers it. This is a relatively comprehensive guide however, there are other things you could do to fully Winterise your boat. It all just depends on how much you think you need to do. Sufficiently preparing your boat for the Winter means that come the Spring, you will be back on the water again quickly, rather than having to invest hours/days getting your boat water ready!